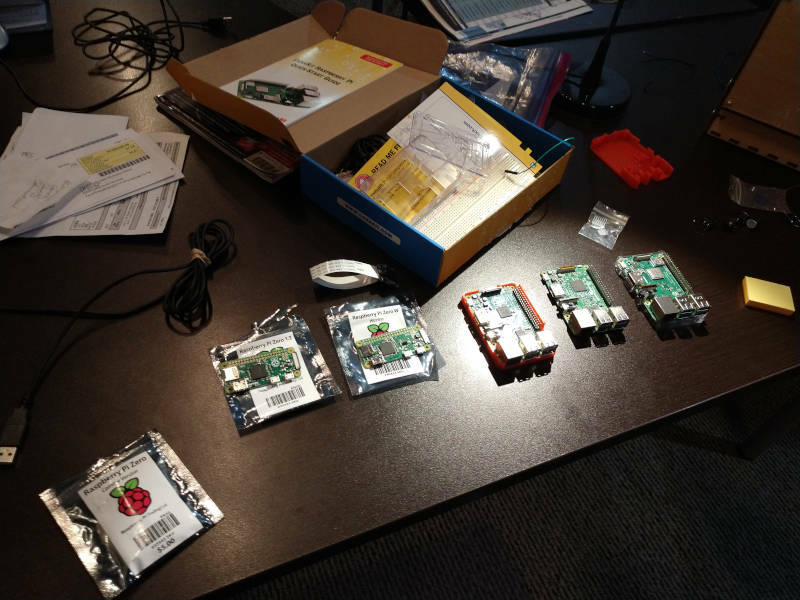 Some of the different Raspberry Pi models at the Makerspace. Many of our posts are youth related, that’s certainly a big part of our mission, but we also encourage adults to get involved in learning and making things. Our meetups are a good example, one of the first we started was our 3DPO (3D Printer Owner’s) Meetup which first began as a group of adults but it wasn’t long before there were some teenagers involved. 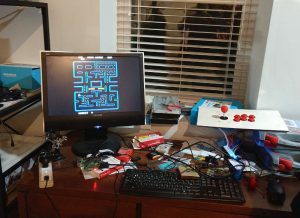 Raspberry Pi with arcade buttons & joystick running RetroPie. The Pi Maker’s Meetup started last November when we got a group together to share information about Raspberry Pi’s. 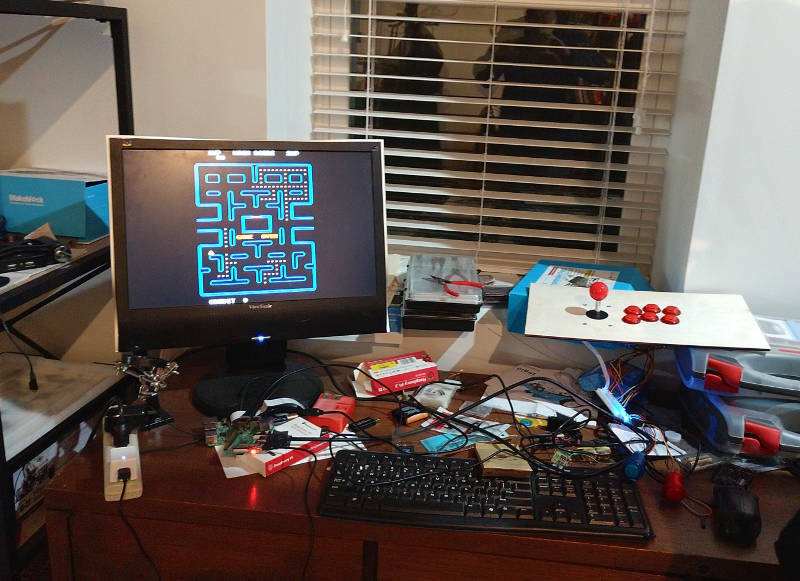 It also turns out we’ve got a group build of MAME system/cabinets going on at the Makerspace that will be running using a RetroPie to emulate various arcade games. The group is still developing and like most meetups, anyone is invited to drop in on our group. Next meeting will be Wednesday February 20th at 7 pm. Please join us then or stop by during our open shop times and we’ll fill you in! You can also sign up for our events newsletter here, be sure to check the Pi Makers meetup box. One of the community efforts that we perhaps promote enough is the local CoderDojo. 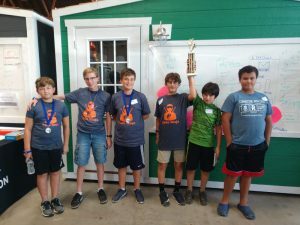 The Castlemakers CoderDojo was one the early ones in Indiana, starting in 2016, and now going on it’s 3rd year. 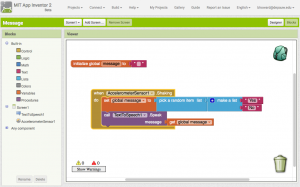 What’s a CoderDojo? Simply it’s a club where youth, ages 7-17, learn programming from volunteers – including professional programmers. 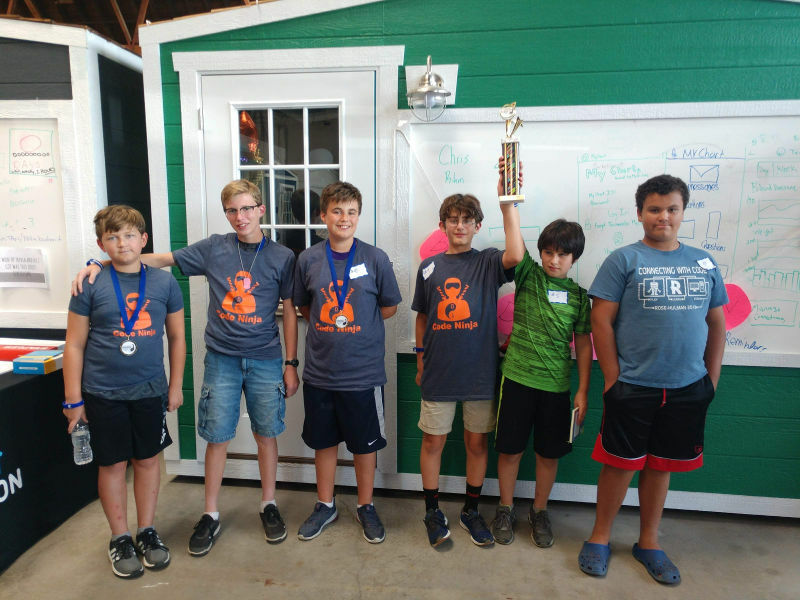 The kids/ninjas bring in projects that they are working on or are interested in… or the mentors have some structured & unstructured exercises to help them learn more about coding. This is the second year we’ve taken kids to the CoderDojo Hackathon sponsored by CoderDojo Indiana / Techpoint Foundation for Youth. Both years we’ve had teams that won trophies, something to be very proud of! Maggie Cline & Courtney Lambert from TPF4Y give Castlemakers’ Brian Howard & Chris Hebb new Dell Chromebooks. We’ve had so much going on lately that blog posting fell off the list. But with so much recent news to tell, we’ll start with a few shorter posts on events and recently made items that folks stopping by the Makerspace have expressed interest in. 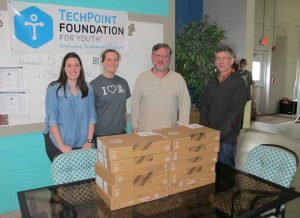 One of the most exciting things – we received 10 new Chromebooks from the Techpoint Foundation for Youth. 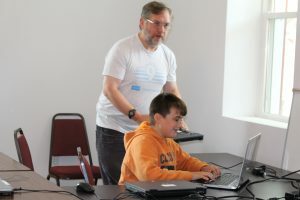 As our monthly CoderDojo has grown, we’ve been looking for ways to have more computers available for kids that aren’t able to bring a laptop to learn more about coding at the meetings. This wonderful gift allows us to have pre-configured Chromebooks for kids to use. Saturday July 1st from 1-4 pm will be our next monthly CoderDojo meeting of the free coding club for youth ages 7-17. We’ll have programmers there to help, or if you’d like to help the kids learning programming please stop by also! 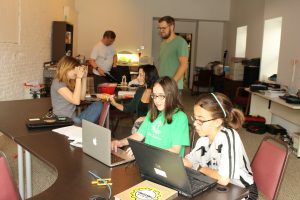 And if you like coding, the inaugural CoderDojo Indiana Hackathon will be in Indianapolis Saturday July 22nd from 9:30-4:30 pm. Anyone can enter & we’ve already got one local team entry going. Saturday afternoon, October 1st, saw our first CoderDojo session at the makerspace on Franklin Street. 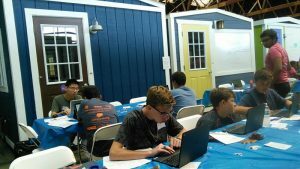 What’s a CoderDojo? The next session will be Saturday, November 5, from 1 to 4 pm. Bring a laptop if you have one, or use one of ours! Bring a project to work on, or try out some of our coding activities! Bring a friend! 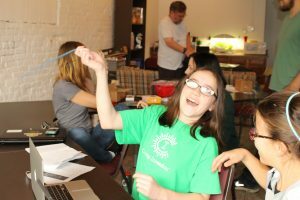 On Sunday, January 17, about a dozen kids learned the basics of coding by building some Android phone apps. We met in a computer lab in the Julian Center at DePauw, and worked through some of the tutorial apps in the App Inventor program from MIT (http://appinventor.mit.edu/explore/). The system is programmed through a web browser, where you can build how the app screen will look (with buttons, labels, and connections to various phone sensors), then shift over to a “blocks” environment where the actions can be hooked up. The first example involved responding to the phone being shaken by sending some text to the speech synthesizer (such as, “Hey, stop shaking me!”). While the app was being developed in the browser, an Android device (some kids brought phones, and the CS department loaned a bunch of tablets for the afternoon) was attached to the session and allowed immediate live testing of the program. The second app we built was like a virtual billiards table. It drew some balls on the screen, and with a flick of the finger they could be launched to bounce around. The App Inventor website allows sharing the projects that are created, and they can be turned into stand-alone apps to download to a friend’s phone. At the end of the hour, a bunch of the kids were excited about being able to continue working on their app ideas at home. Alice turned her random yes/no app into one that could generate a random story idea for a Doctor Who episode (example: “The Doctor and Rose battle the Daleks in New New York, accompanied by Captain Jack.”), and then worked with a friend to build a pair of apps that told each other knock-knock jokes (using a speech recognizer as well as the speech synthesis)! App Inventor is related to the Scratch environment, which can be used to control Arduino boards, so it’s likely that there will be more sessions like this in the future. 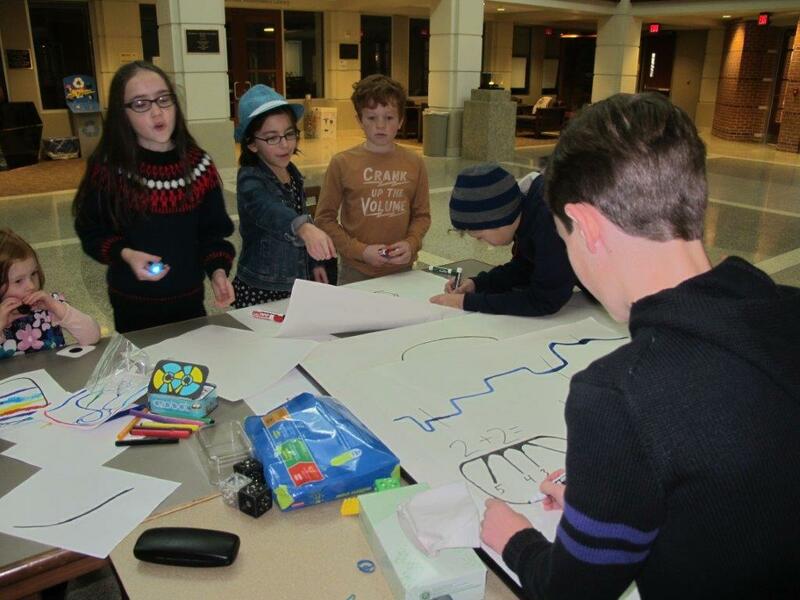 Dunkin works on one of the prototype tests for the ozobot. A few cubelets are in the lower left corner. In today’s meeting we looked at ozobots & dug out the cubelets to try and get the Bluetooth control working. 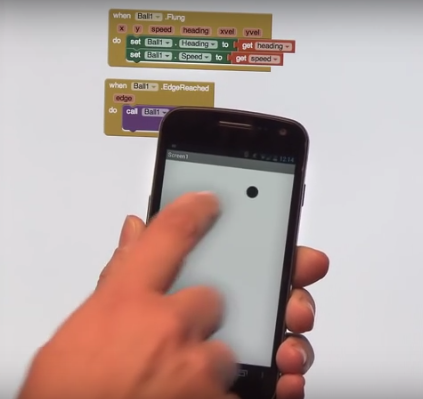 Technical difficulties prevented the cubelets from working with the remote control app. But the ozobots were a bigger hit anyway with both the kids and adults there. Ozobots are tiny dome like robots that have optical sensors that are used to follow lines. These lines can also program the little guys, through shapes and colors. Using a marker they will follow the line you draw but by using different color patterns they will change speed, change direction, pause, stop and even count. It was amazing to sit back and watch the kid’s creativity. 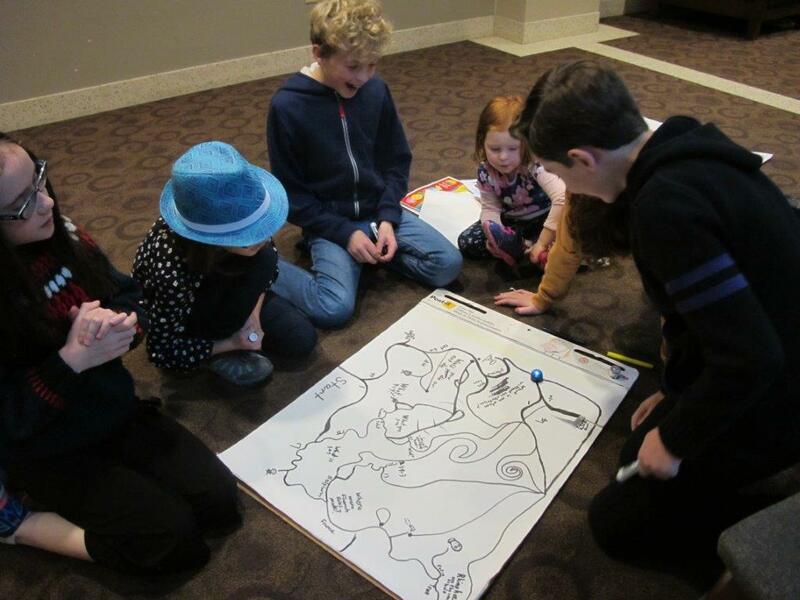 After a brief introduction to the ozobot, the kids discovered much more on their own. Following mazes and lines drawn on paper, along with guessing which branch the ozobot would take dominated the afternoon. The kids decided to “test the robot’s artificial intelligence” by creating questions that the robot could ‘answer’ by choosing the right path. 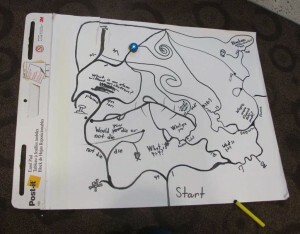 The maze they created started with simple questions like 4 divided by 4, then progressed into more difficult questions like which country created french fries. 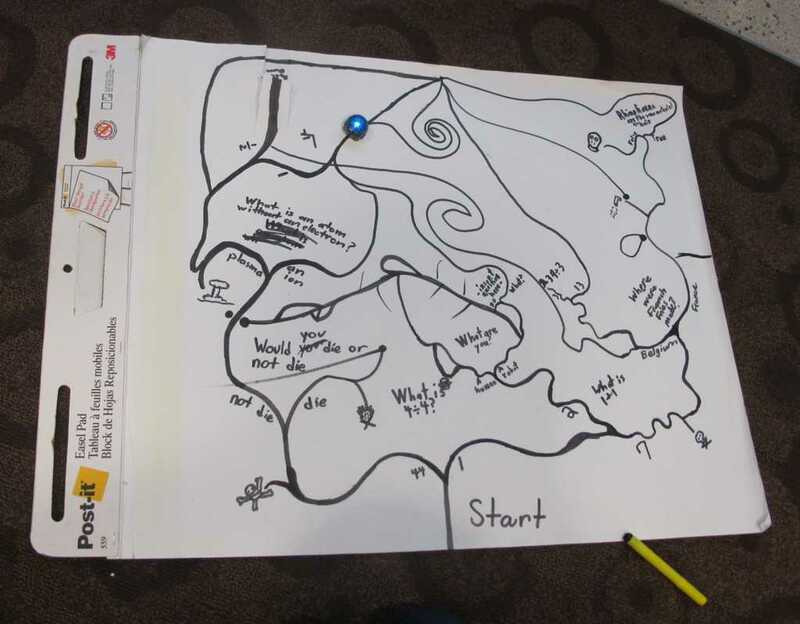 There were plenty of death traps and black holes along the path for the ozobot if a wrong decision was made. They decided to conduct tests for both ozobots , you can watch one trial in this video. Of course the robot didn’t really evaluate the questions, just took a random path, but they still had fun. The final test path they created. You can see one of the ozobots following the line near the top of the picture. In this trial it picked the correct answer for 4 divided by 4 and even chose the robot vs. human path. The ozobot color changing capability was a huge hit (different colored lines cause the bot’s LED to match the line color). They are somewhat sensitive to line width, but it’s not a huge factor. The large dry erase board attempt didn’t work well, the bot would eventually scrape off some of the marker then stop. Ozogroove, the dancing app, was pretty useless on a Nexus 7 – don’t bother to install it on that tablet at least. We’re going to have to experiment some more with hand drawing the ozocodes, the programming language for the robot. It seemed to be inconsistent, sometimes working and sometimes not, even for the same color coded lines. Printed ones worked great. There’s also a coding language, ozoblocky, but that will be a future meeting.